Kamen Rider Black: Taiketsu Shadow Moon (, 仮面ライダーBLACK 対決シャドームーン?, lit. Masked Rider Black: Shadow Moon Shodown) is an action game deveoped by Human Entertainment for the Famicom Disk System, published by Bandai in Japan in 1988. It is based on the Kamen Rider Black television series, which was the eight installment of the Kamen Rider superhero series. 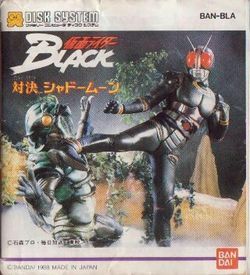 In the game, players take control of Kamen Rider Black, who must defeat numerous Gorgom mutants. There are five levels of four stages each. In the first four levels, players must complete three side scrolling stages with a boss at the end. In the fourth stage, the player must fight against a final level boss using a zoomed in perspective with larger sprites. The player gets to ride Battle Hopper motorcycle throughout the second and fourth levels. The fifth level is composed entirely of boss fights, first against three Evil Lords, and then against Shadow Moon. If the player loses against Shadow Moon, the bad ending is shown before the game ends. The game itself is considered rather poor, and was very disappointing to fans of the series. The controls of the game are especially bad, requiring the player to press for punches, but for kicks. The player moves considerably slowly on foot. Pressing results in a jump that either barely leaves the ground or flies to the top of the screen, and leaping forward can only be accomplished by pressing right late in the jump, while tapping and simultaneously causes the player to somersault. Stages have very little variety in terms of enemies. Few players can muster the patience it takes to play through this game. This page was last edited on 27 September 2012, at 04:13.